Suniva Inc., a Georgia solar manufacturer that claimed to use mostly U.S. content, was deep in debt to foreign suppliers when it went bankrupt last month. Its top three creditors -- Wacker Chemie AG of Germany, Woongjin Energy Co. Ltd. of South Korea and Silfab Solar Inc. of Canada -- are collectively owed $14.8 million. Images courtesy of Wikipedia, Woongjin and Silfab Solar. Suniva Inc. is an American solar manufacturer that has often waved the flag, claiming that its products are 80 percent American-made. When it went bankrupt last month, it asked the Trump administration to raise worldwide tariffs, saying it was the only way the beleaguered American manufacturer would survive. But according to its bankruptcy documents and the labels on some of its own products, the company has been doing assembly in and buying tens of millions of dollars of material from the very countries it wants to keep out. The company's bankruptcy filing reveals that the overwhelming majority of Suniva's commercial debt is to a web of international suppliers, including a silicon maker from Germany, wafer and module companies from South Korea, chemical and metals firms from China, and a panel assembler in Canada. A broker and a customer said they have seen Suniva's solar panels labeled as imports from Canada, South Korea and China. Suniva did not respond to requests for comment. The Georgia manufacturer became the subject of controversy last month when it filed a petition with the U.S. International Trade Commission, asking for blanket trade barriers against solar cells and modules from countries around the globe. If the case proceeds, it will arrive in October at the desk of President Trump (Energywire, May 8). There it could become a flashpoint on energy, climate and trade. China's solar industry, heavily subsidized by its government, has cut prices and nearly snuffed out U.S. manufacturing of crystalline silicon photovoltaic (CSPV) cells and modules. But those same inexpensive imports have fueled a dramatic growth of solar energy on the U.S. electric grid and lowered the country's carbon footprint. Suniva's story was already complicated enough, since this company that inveighs against Chinese imports is majority-owned by Chinese firms (Energywire, May 10). The issue of the company's own sourcing adds another contradictory layer. The information revealed in Suniva's bankruptcy documents is surprising because the company itself set an extremely high bar. On its website, which has now been taken offline, the company claimed to use 80 percent domestic content in its modules. That is in excess of the 50 percent that is required under the Buy American Act, a law that applies to purchases made by the federal government. "Suniva is one of only a few U.S.-operated manufacturers that offer Buy America-compliant modules, which contain more than 80% U.S. content," the company's website read. "Our premium solar modules have one of the highest percentages of U.S. content in the industry. Suniva's GA and MI based module assembly facilities offer even greater value to customers requiring 'Buy America' solar products." Suniva, which got $8.8 million in research funding from the Department of Energy, was a consistent supplier of solar to the U.S. government under contracts that would be subject to the Buy American Act. "Suniva modules are deployed in government applications of all sizes, for all branches of the US Military, the State Department, the Department of Veterans Affairs, the Federal Aviation Administration, and the Department of Justice. You will find our panels on schools and courthouses across the country, municipal water treatment facilities and transit terminals," the website read. It added, "If someday you happen to be elected President, you will even see our panels on your helicopter hangars." 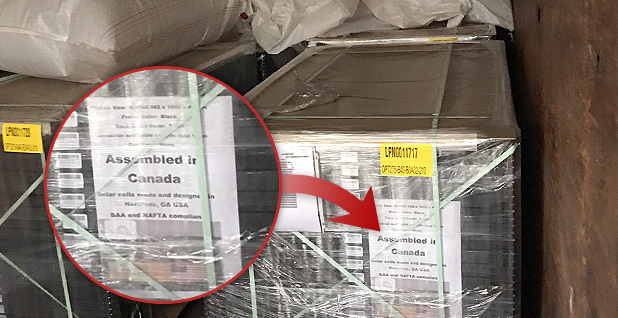 Mike Diethelm, a rooftop solar installer in Asheville, N.C., was surprised to find an "Assembled in Canada" label on solar panels he purchased from Suniva Inc. The manufacturer says it is a "Buy America" company that sources almost entirely from the United States. Photo courtesy of Mike Diethelm, SolFarm Solar Co.
Suniva's trade case has had some people taking a closer look at the labels on the company's solar panels. Some bear labels of origin that would seem to contradict Suniva's American sourcing, in spirit if not in the letter of the law. Mike Diethelm is the founder of SolFarm Solar Co., a small residential and commercial solar installer in Asheville, N.C. For years, he said, he had been trying to persuade Suniva to supply him with panels, since the company had a strong made-in-America reputation. "It seemed like a good sales tool to get a good-looking, locally made panel that isn't from far away in Georgia," he said in an interview. Finally he was able to make a $50,000 order, and two months ago the shipment arrived. Unfortunately, it was short — only $30,000 came — and two-thirds of those were on pallets that were labeled "Assembled in Canada." He returned the Canadian panels, just in time for the company to go bankrupt last month. The loss has had a "huge" impact on his bottom line, he said. A similar scenario is painted by Jay Granat, a solar broker and liquidator in California. In March, he helped sell nine pallets of Suniva panels, which sat in a warehouse in La Palma, Calif.
"La Palma is, of course, right next door to the Port of Long Beach, where most solar panel imports come into the U.S.," Granat said. Next to the serial numbers and specs was listed the shipment's country of origin: South Korea. Another source provided E&E News with undated Suniva labels stating they were imports from China. Of Suniva, Granat said, "You guys are big stinking hypocrites." In a filing with the ITC on Friday, Suniva addressed the topic of its sourcing, saying that while it did some assembly abroad three years ago, it now does almost all of it domestically. "Suniva, since its inception, has always produced all of it [sic] own CSPV cells, and has always done so in the United States. That is, Suniva has never used or purchased CSPV cells produced outside of the United States. However, in the past, Suniva had used non-U.S. based contract manufacturers to assemble its U.S.-made CSPV cells into modules. In 2014, once its Saginaw, Michigan module factory came on-line, Suniva began scaling back those non-U.S. operations," the filing said. A detailed look at Suniva's bankruptcy records reveals that almost all of the $38.4 million that it owes commercial creditors is to foreign companies or U.S. subsidiaries of foreign companies. While the documents don't say what Suniva purchased, they raise questions about how the company incurred such large foreign debts while also complying with its claim of 80 percent sourcing from American shores. $5,775,000 to Wacker Chemie AG, a German supplier of silicon. 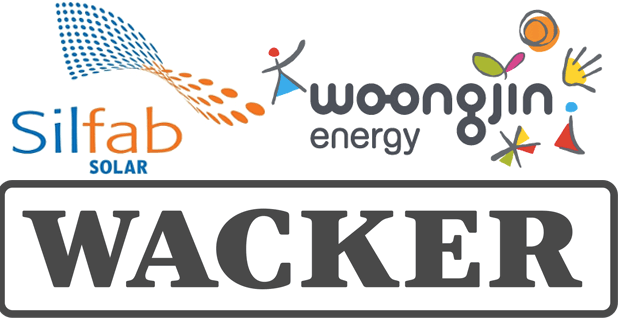 $4,970,352.06 to Woongjin Energy Co. Ltd. of South Korea, a maker of solar ingots and wafers that was founded as a joint venture between Woongjin Group, a Korean conglomerate, and SunPower Corp., an American solar manufacturer that was later acquired by French oil giant Total SA. $4,141,376.02 to Silfab Solar Inc., a solar module maker outside Toronto with joint Italian-Taiwanese ownership. It is "a family of vertically-integrated PV product companies, systems and developments that span the entire photovoltaic supply chain," according to its website. The Taiwanese owner, Pan Asia Solar, has two principal arms in Taiwan: Sunrise Global Solar Energy Co., a solar cell manufacturer, and Sino-American Silicon Products Inc., a maker of solar ingots and wafers. $2,737,376.07 to Posco Daewoo Americas, the U.S. subsidiary of Posco Daewoo Corp., one of South Korea's largest industrial conglomerates. The company's Korean headquarters announced in July 2016 that it had sold $17 million of solar modules, originally made by Hyundai Heavy Industries Co., to American solar power companies. $1,501,826.68 to SunEdison Products Singapore (SPS), a subsidiary of bankrupt solar company SunEdison that makes silicon modules. SunEdison's bankruptcy documents shed light on this transaction. In May 2012, Suniva and SPS signed an agreement: SPS would provide wafers, which Suniva would make into solar cells and sell back to SPS. Suniva fell behind in its payments to SPS, while Suniva was owed money by SPS's parent, SunEdison. In March, the companies agreed that Suniva would pay SPS $1,559,877.30. That is similar to the amount that Suniva's bankruptcy documents say that Suniva owes SPS. Suniva also counts seven Chinese solar suppliers among its top 30 creditors — an odd distinction for a company that has singled out China as the main reason for the demise of U.S. solar manufacturing. Among these debts are $766,634 to Guangzhou Ruxing Technology Development Co., a maker of aluminum paste, which is used as a backing material in the making of solar cells; $545,548 to Jiangxi Haoan Energy Technology Co., a provider of silicon ingots and wafers; $391,360 to Cniec Shaanxi Corp., an exporter of metals; $358,996 to Asia Union Electronic Chemical Corp., a maker of semiconductor chemicals; and $351,811 to Zhejiang Jiafu Glass Co., which fabricates glass for solar panels. In its complaint with the ITC, Suniva blamed its troubles on ultra-cheap products from Chinese companies, which get generous support from the Chinese government. When an earlier round of tariffs raised prices on Chinese solar products, Suniva said, China shifted its manufacturing to other countries that aren't targeted by the tariff. Suniva staked its domestic reputation on its 'Buy America' status. But what does 'Buy America' mean, and is Suniva in violation of it? Trade experts interviewed for this story said that the designation has lots of loopholes and isn't regularly enforced, which gives Suniva lots of wiggle room. That said, several companies have been found in violation and have faced painful penalties. The relevant law originated during the Great Depression. In 1933, Congress passed the Buy American Act, which was meant to prop up domestic businesses and jobs at a time of economic distress. It mandated that the federal government preferentially choose suppliers that source 50 percent of the value of their content from the United States. The law applies only to Suniva's federal contracts, not its private ones. However, other customers had reason to think that a company that promised "one of the highest percentages of U.S. content in the industry" was in fact sourcing from the United States — especially since Suniva claimed 80 percent domestic content, which is far higher than the 50 percent that the law requires. The government generally takes its suppliers at their word that they're sourcing domestically, and no federal agency actively polices the "Buy American" label, said Dismas Locaria, a government-contracts partner at the law firm Venable LLP. Loopholes make wide exceptions. For example, the law doesn't apply if the product can be bought off the shelf. Also, if the contract exceeds a certain amount — currently it's $193,000 — another law kicks in that waters down the requirement. The Trade Agreements Act of 1979 essentially extends the "Buy American" umbrella to dozens of countries with which the United States has trade agreements. As long as a product is "substantially transformed" while in that country — a hazy term that is open to interpretation — the federal government treats its content the same as domestic content. Of the countries Suniva is most indebted to — Germany, South Korea, Canada, China and Singapore — only China is not covered under the Trade Agreements Act. If a company is investigated, it often originates from a complaint by a competitor or an employee. The inquiry could be led by the Department of Justice or by the inspector general of the federal agency that made the purchase. In this century, only a few companies have been caught in violation of the law. All of them failed to disclose they had sourced their material from Asia, and in most cases specifically from China. In 2011, an industrial and construction supply company called Fastenal Co. paid $6.25 million, and the same year Home Depot Inc. paid $3.15 million. In 2005, office supply companies Staples Inc. paid $7.4 million and Office Depot Inc. $4.75 million for violations of the law.